Fox NewsSen. 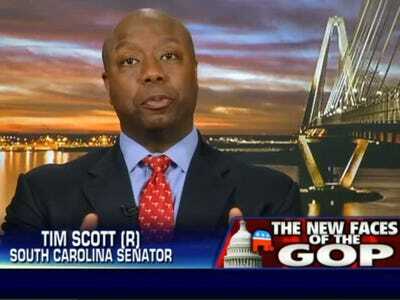 Tim Scott on Fox News. Sen. Tim Scott (R-South Carolina), the first black senator elected in the South since the Reconstruction era, is no fan of racially tinged Democratic attacks on his party. “The voters continue to repudiate that approach to politics,” he added. Scott, who won his re-election bid Tuesday, was responding to recent remarks by Rep. Charlie Rangel (D-New York) that have directly connected some Republicans to confederates. He dismissed Rangel’s comments as “ridiculous” and argued that the past few election cycles proved Southern politics had changed. “If you look at [Gov.] Bobby Jindal in Louisiana — a person of colour. Look at my governor, Nikki Haley — a person of colour. And now myself. The South has made so much progress. And the best thing that folks like Mr. Rangel can say is that he’s going to harken back to a 100 years ago, or 70 ago. Let’s talk about tomorrow,” Scott said. Scott is one of only two African-American members of the Senate along with New Jersey Democrat Cory Booker. On Thursday morning, Scott also went on MSNBC’s “Morning Joe” to praise the progress his home state and the whole region had made over the decades. Watch Scott on MSNBC below.